First of a six-part series about my trip to Seattle this past August to see Wagner's "Der Ring des Nibelungen" performed by Seattle Opera. LUGNUTS FROM LOGE. . . I spent many years flying to the Orient and back, and lost my taste for extra leg room long ago. Plus I am not exactly confident in my luck, generally speaking. Add to that all the horror stories of air travel today, and it takes a lot to get me on a plane. A lot, as in Wagner’s “Der Ring Des Nibelungen,” as staged by Seattle Opera every four years. No, I’m not a “Ringhead”---those who travel the world in search of “Rings” (where do they get their Rhinegold?) ---but I am elated to see these operas staged more or less as composer Richard Wagner directed. Which is to say, literally---where Valkyries do not look like lesbian junky bikers, and Nibelungen do not suggest the incarcerated of WWII concentration camps. Thank you, Seattle Opera director Speight Jenkins. So I took my shoes off for Homeland Security, obeyed orders to remove the foil-wrapped antacids from my pockets so as not to trip the metal detectors, stepped aboard one of those little 737 winged buses, chewed the complimentary peanuts, read the New York Times, and looked out the window. It was really, really good to get away. I mean, it was good just to get 37,000 feet up and away. I confess to having been rather battered recently, first by a shoulder injury that landed me in the ER (where I regained a slight amount of faith in humanity, courtesy of noble paramedics, nurses, cops), and then by a very tenacious virus that really, really liked my bronchial tubes, and environs. And did I mention the acid-fried stomach lining? Well, skip that. Anyhow, on top of all this, the week before departure was taken up with much melodrama over a rescued kitten (I’ll tell you that story when we meet for a long lunch, if you really insist), and then this old friend began behaving like a new enemy, and, oh hell, the truth is that I was a wreck. Still am, but at least I was a wreck on vacation. Then, around the same period, came that Really Big Shew and those four Beatle fellows. I liked them well enough---more than I realized---but I was mostly baffled as to why “the girls” went berserk at the mention of their names, and the sight of their bouncing locks. Although “Twist and Shout,” which was played on the school bus via microphone stuck up against a transistor radio (nice bus driver), gave me goose bumps. Now I’m nearly 100 years old (well, closer to it than my childhood), and Wagner and The Beatles still, to paraphrase Paul’s reference too Ringo’s drums in “A Hard Day’s Night,” loom large in my legend. Der Ringo des Nibelungen. 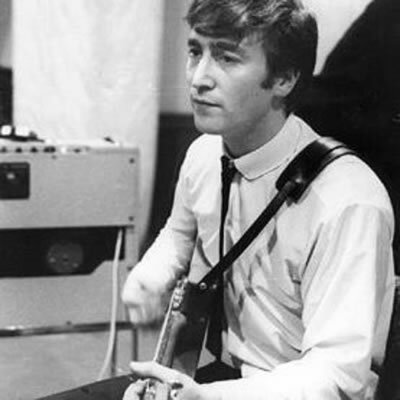 So my eyes were closed, and car-infested California drifted hazily below, and I was thinking about how Lennon the outsized personality, Lennon the cripplingly insecure, Lennon the capricious and mercurial egomaniac, gave the Beatles such brilliance---and took it all away in the end. Really bringing about Gotterbeatlerung. Beatledamerung. Twilight of the Fabs. And how much better the “Let it Be” and “Abbey Road” albums might have been had Lennon been more committed to the group at that point. . .I heard his voice in my head. . . “One and one and one is three. . .” Three Beatles Vs. McCartney, that’s what it was in the end, driving their old bandmate/music director/facile melodist away. . .So said Gilmore in the article in my lap, and I think he’s right. 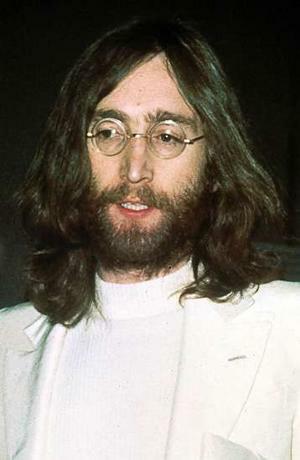 Yoko and Paul are forever blamed for the break-up, but it was John who told the others that he was leaving the band. Still, anything as magnificent, powerful, ambitious, magical as The Beatles was doomed as the gods of "The Ring." I opened my eyes to volcanoes. The remains of Mt. 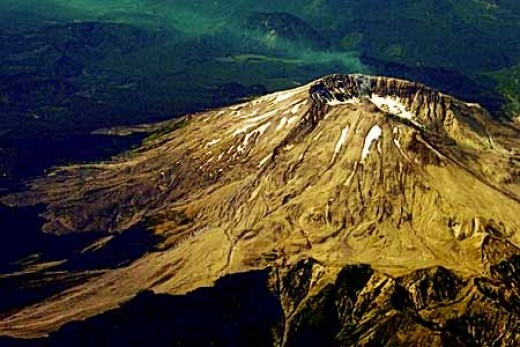 St. Helens lay below, peeking (peaking?) through clouds that looked like cotton balls. 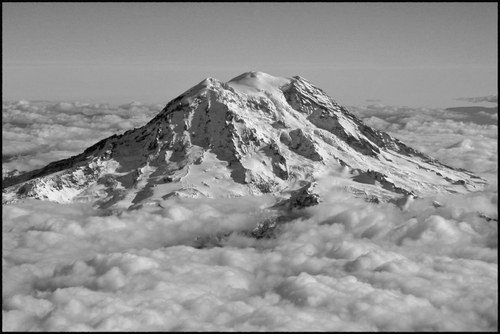 And then the astonishing Rainier, snow-adorned in August. Colossuses as dramatic as Wagner envisioned for Valhalla, fortresses in the clouds, where gods might have dwelled in castles built by giants, to be sure. And I had a vantage point Wotan the god-king might have envied, or the Valkyries, riding back to the heavens with fallen warriors on their horses. Small wonder, when I got to Seattle Opera, the poster showing Valhalla looked exactly like. . .Rainier. Somehow, as happens so casually countless times a day the world over, the plane fell out of the sky and set down easily on the ground. Another twenty minutes and I was waiting in an underground garage for a shuttle, when an old fellow appeared in front of me. He wore a quasi-official outfit and cap, a trim white moustache, and a practiced twinkle in the eye. Now, when you’re on Xanax, and feel as though Muhammad Ali and Joe Frazier had given your psyche a Thrilla in Manilla of late, you don’t bat an eye at things like this. And I didn’t. I smiled. What else should I do? Now, I should note, I guess, that strangers do generally just talk to me, and always have, all my life. But in this case, the gentleman actually seemed to work for the shuttle service, and had taken it upon himself, apparently, to throw in a little. . .entertainment. At least he was certainly entertained. “And this, I guess you’d call him an inmate, came up to me and asked what was the matter. I told him, ‘I lost my lugnuts!’ Well, he looked at my changed tire, with no lugnuts, scratched his chin, and then said, ‘Well, why don’t you take one lugnut off of each of the other tires, then each tire will have three, and that should be enough to get you to a garage." At this point, I had tentatively concluded that I was going to spend quite a while in the Seattle Airport parking garage, possibly years, listening to this joke. To my great surprise, I was proven wrong. I confess that I laughed, both because I enjoy genuinely inane jokes, and because I wanted him to be happy. He was, after all, obviously sent by Loge, the god of fire and mischief, and you just don't mess with Loge. next week: grinders, Rhinegold, and Achmed Abeboogiewoogie. © 2009 Rip Rense. All rights reserved.